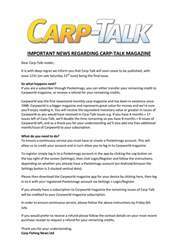 This week’s issue of Carp-Talk (issue 1064) is available to download now. The fantastic Snake Pit Common at 51lb and forties from the Nene Valley, Northamptonshire, Walthamstow and Ashmire Lake top the catches in this week’s mag. 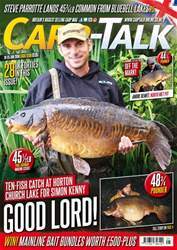 Jack Brown gets his angling year under way on Thorpe Lea, and Team Korda extols the virtues of using bright hookbaits in spring. Rich Seeds concludes his mini-series about his season on Farriers Lake, and Chris Lowe reflects on an unbelievable day trip to Acton. 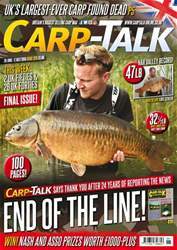 Products from DNA Baits, ESP, Wychwood, Sticky and Gardner go under the spotlight in ‘Trade Talk’. 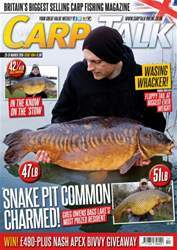 The Mainline Carp Angler of the Year competition continues, we have £495-plus worth of Nash Apex Bivvies to give away, and this month’s Wychwood Rising Stars are announced.